My son Noah and I love Myrtle Beach so much that we return every summer. 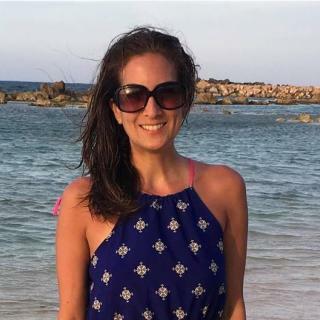 I mean, what’s not to love with gorgeous sunrises over the ocean, thrilling beach activities, family-friendly attractions, historic roots, hot sunny weather, and welcoming Southern hospitality? Noah and I are vegan and have been passionately following a plant-based diet for eight years. According to recent projections, 2019 is going to be the biggest year for vegan food yet, not only in grocery stores but for restaurants too. Throughout our visits to Myrtle Beach, we have searched for vegan food and have been really happy (and full!) with all the yummy meals we discovered. This helpful vegan travel guide lists some of the places we enjoyed so far. If you have a favorite vegan meal in Myrtle Beach please let us know so we can check it out on our next visit. As we say in Canada, Bon Appetite! We love Gordo&apos;s Tacos and Tequila and have returned several times. They create authentic Mexican dishes and have vegan menu options or simply request substitutes. Noah and I start with a yummy platter of fresh guacamole and a heaping portion of salted tortilla chips. The vegan tacos are delicious and Noah loved the burrito they made packed with rice, beans, and fresh veggies. Gordo’s has a bar but is also the perfect venue for families due to their casual fun atmosphere and groovy decorations. 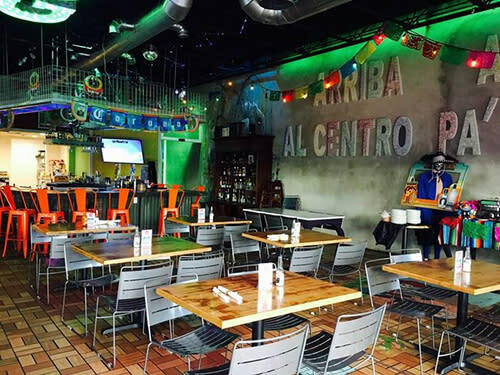 Funky red chairs, Mexican art on the walls and Latin music lend to the exciting ambiance. They are centrally located among the action on 9th Avenue, so after dinner, we usually walk along the strip picking up souvenirs and strolling down the famous boardwalk set against the ocean. Not only can you enjoy a nutritious meal at Bay Naturals Healthy Market & Kitchen, you can bring home groceries. We like to stay in hotels with kitchens to prepare some meals in our room for nights we stay in. 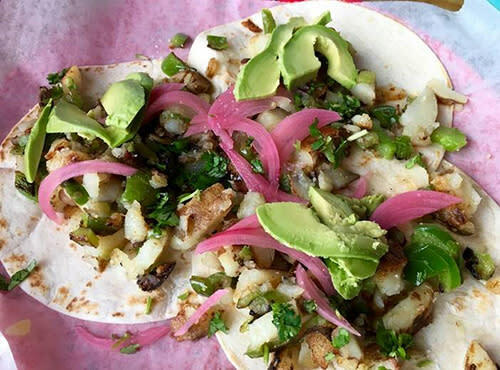 They have daily specials, signature smoothies whipped to perfection with soymilk, fresh juice, salads, burritos, tofu scramble, quesadilla, veggie burgers, wraps, and more. Vegan items are clearly marked to make ordering easy. After your meal check out their healthy market and stock up on everything you need for a vegan picnic at the beach. 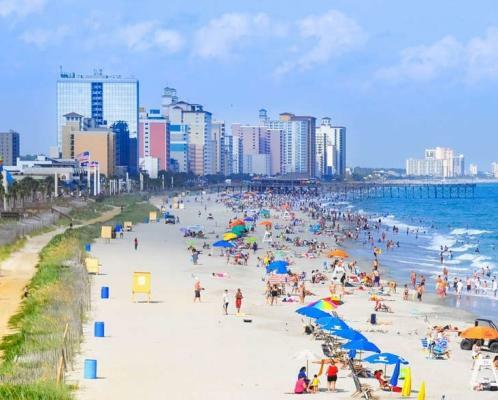 There are two locations; North Kings Highway in Myrtle Beach and Highway 17 North in North Myrtle Beach. After a busy day exploring Broadway at the Beach several years ago, we weren’t sure where to eat, as vegan options here seemed daunting. But when we passed by King Kong Sushi we decided to give this Asian bistro a try. The outdoor patio facing Lake Broadway sealed the deal. Whenever I eat at sushi restaurants I politely ask them to use a separate knife and cutting board to avoid cross-contamination with fish. Although most of their menu is not vegan, various Maki rolls saved the day. We turned this it into our main course and chose avocado, cucumber, carrot, asparagus, and veggie rolls and a side of Edamame. For dessert, we walked over to It’Sugar – a candy-obsessed specialty store dedicated all things sweet and indulgent with plenty of vegan options for Noah to smile about. 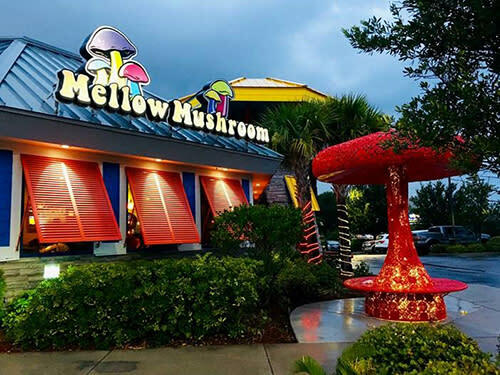 Not only is Mellow Mushroom one of our favorite restaurants in Myrtle Beach, it’s one of our favorite pizza parlors in the United States! Noah and I start with a house salad minus the shaved Parmesan or build your own salad. Next, we create our pizza masterpieces including vegan Follow Your Heart dairy-free cheese. 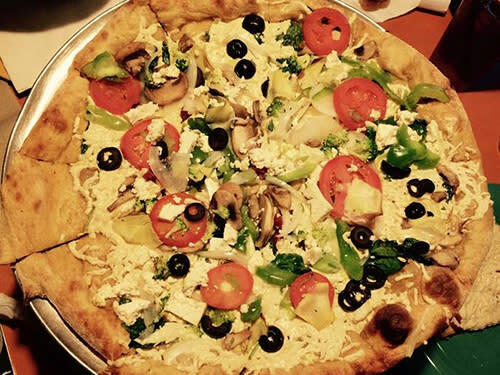 Toppings are plentiful and include tofu, tempeh, olives, green peppers, roasted tomatoes, artichoke hearts, spinach, roasted mushroom trio, basil and more. Noah gets his pie with Mellow red sauce and mine has olive oil and garlic. We go to the location on 21st Avenue but they also have restaurants in Murrells Inlet and North Myrtle Beach. Mediterranean cuisine is jam-packed with tasty and enticing vegan food so your hardest decision will be what to order when you dine at Jerusalem Mediterranean Restaurant & Bar on North Kings Highway. Noah loves hummus and insisted on his own platter and we both love dipping in hot pita. We skipped the entrées and went right to ordering an assortment of delicious side dishes, or what they refer to as hot or cold Mezze. Their menu items are clearly labeled what is vegan and includes tahini, Israeli salad, tabouleh salad, dolma (stuffed grape leaves) and their famous crispy falafel. Speaking of hummus, it’s all the rage at Z’s Amazing Kitchen in North Myrtle Beach on Highway 17 North. This family-owned business has reasonable prices and friendly service. They provide vegan and gluten-free menus making ordering super easy. In addition to delicious homemade hummus and grilled pita we dined on veggie-fried rice with tofu, and the superfood salad loaded with couscous, quinoa, and veggies. When you order at the counter tell them you are vegan if you want Panini’s, sandwiches, tacos, or wraps and they will let you know how they can vegan-ize their signature dishes. Yes, it’s entirely possible to eat vegan at Sea Captain’s House on North Ocean Blvd, and although your choices are limited, it’s worth the ocean view and an enjoyable fine dining experience. It’s also a good option if you are out with non-vegan friends that want seafood. As the story of this restaurant goes, Hurricane Hazel’s destructive path in 1954 lead to events that transformed this former guest manor into the popular restaurant it is today, known for live music and Southern food with a twist. Noah and I were there years ago before their vegetarian and gluten-free menus, so we informed the friendly staff we were vegan and they whipped up pasta and veggies without butter. They also prepare veggie stir-fry with rice and for dessert, they have a colorful fresh fruit platter. Kindbelly Café on 79th Avenue in North Myrtle Beach is known for serving healthy meals that are organic, non-GMO and locally sourced as often as possible. This family-owned business that began by selling their own microgreens at local farmers markets has many plant-based options. Choices include organic tofu scramble, organic micro greens, wraps, salads, acai bowls, burritos, and organic kombucha on tap. They also make their own smoothies with organic plant-based protein powder. They are open for breakfast and lunch but do not serve dinner. E Noodles & Co on 20th Avenue South was the first restaurant Noah and I went to for dinner in Myrtle Beach many years ago. We walked over from Hampton Inn & Suites Myrtle Beach Oceanfront (About 10 minutes) after an employee at the hotel told us she heard they had amazing veggie dishes. Noah loved the vegetable fried rice and we added tofu to ours with Edamame on the side. Other tasty vegan dishes include steamed mixed veggies, fried tofu with black bean sauce, spicy glass noodles with bean sprouts, rice vermicelli, and a mixed veggie platter. E Noodles has a location in North Myrtle Beach too. Many Southeast Asian dishes can easily be made vegan. Noah and I went to CO in Charleston, South Carolina years ago and I was truly amazed at how many dishes they can vegan-ize. 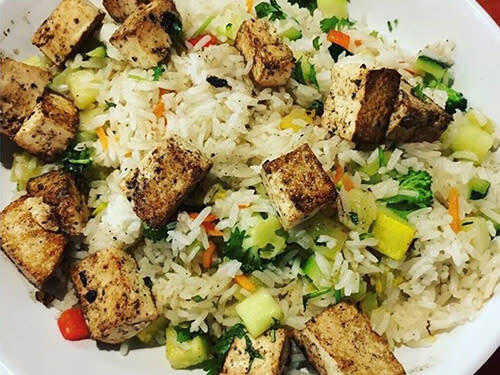 Their tasty food is packed with bold flavors and their vegan menu includes rice vermicelli noodles, tofu rolls, spicy Udon with snow peas, Hibachi with lemongrass tofu, and Futomaki with cucumber, avocado, and yam. They also have refreshing cocktails that are perfect after a day of exploring under the sun. CO is located in the Market Common and is on the top of our list when we return to Myrtle Beach this summer. Save us some vegan crispy vegetable rolls! Note: Before ordering anything from a restaurant that also serves non-vegan items I always confirm the ingredient list and explain we don’t eat anything with animal byproducts. Since restaurant suppliers and menus change I recommend speaking to the chef before ordering, especially if you have allergies.